As tattoo artists, we’re always looking for that next trick or piece of equipment that will take our skills as an artist to the next level, after all, talent can only take you so far. Sometimes, to take that next step, you have to invest in ​higher quality products like Intenze Ink​. However, nobody wants to spend the money if it’s not going to do anything for the quality of their tattoos! So in this Intenze tattoo ink review, you’ll find out if Intenze Ink is something that will help take your ink to the next level or not. 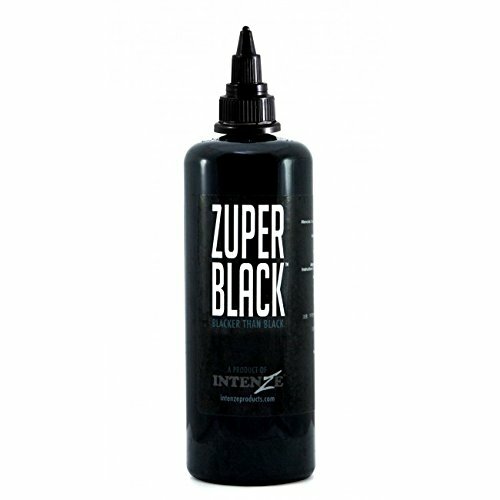 Intenze Tattoo Ink Zuper Black is the darkest ink offered by Intenze ink. It’s a high quality black tattoo ink that, not only is extremely black, but also extremely sterile! Intenze Ink has made its goal is to make the safest tattoo ink in the world. Also, the ink was tested and developed with some of the top tattoo artists in the world, with safety and the tattoo artist in mind. What’s So Great About Intenze Zuper Black Tattoo Ink? Using Intenze Zuper Black Ink has a lot of advantages, but it is not great for every kind of job. This particular ink is best suited for really packing in ink. The ink is really thick and really black making it perfect for packing in ink, but not really for doing lines. If you’re doing tattoos like tribals you can’t find a better ink than this. If you need an ink for lines, but want the quality of Intenze, that I recommend getting the​ Intenze Tattoo Ink True Black for lining to do your lines. I Shouldn’t Use It For Lines!? As I mentioned earlier this ink is kind of a one trick pony. While it does that one trick EXTREMELY well, the fact that it isn’t good for lines is an extreme set back. The reason it’s not great for lines is it's just so thick, and since it’s so thick it has a high chance of spreading making the lines look a little blown out. The thickness also makes it a little hard to make grey wash with.